BEFORE: Insomnia is a film I have seen before. This was Christopher Nolan’s big test for Warner Bros. before he was given the reins to do his highly popular Batman reboot. 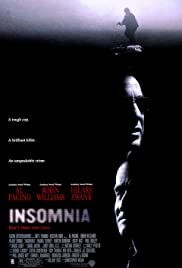 Like some other films I have seen before, I don’t remember too much about Insomnia. Generally, I do remember liking it and I believe there’s a twist at the end, but other than that, it’s just a big mystery. AFTER: Insomnia is a mystery film, but it lacks mystery. There is a mysterious air about the film, an ominous feeling if you will, but it isn’t that puzzling. And that’s not just due to a second viewing, in fact there were many twists that I did not remember, but rather due to a general lack of surprise. Nolan definitely has the thriller aspect down, just not the mystery. What is very well done is the cinematography. Wally Pfister, Nolan’s Director of Photography for all his films, really takes advantage of the beautiful Alaskan location. The vistas are gorgeous and even the close ups on the acting are well shot with great contrast between foreground and background elements. So how did Insomnia hold up for a second viewing? Not as good as I remember but still a good film all around. If you’re a fan of Nolan, you’ll enjoy this film; it’s very Nolan-esque and fits in with the rest of his ouvre.